1st Contact – Group will be asked to close the gap with the group in front of them. 2nd Contact – Group will be given a second opportunity to close the gap but will be told that if there is no improvement when contacted again, the group will be penalized — Group may be monitored to determine if lack of position is being created by an individual, individuals or entire group. 3rd Contact – If the Group’s position has not improved, the individual(s) or group will be penalized two strokes. The new Millennium brought along with it increasing growth for the DWGA. Individual membership participants were reaching close to 500 golfers and 29 member clubs. As the Association grew physically in size it also established a place on the Internet. So April 1, 2000 the DWGA official website, dwga.org, was launched. The website enabled the DWGA to share information related to tournaments, open days, member clubs, junior golf, and photo galleries among a broader audience. 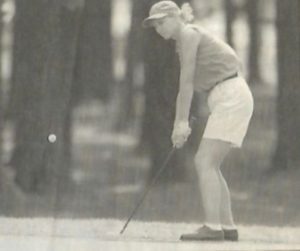 Not only did Vicki Abens take the DWGA Amateur title for the year 2000 but six weeks later she also earned the DWGA Tournament of Champions title with a 5-over-par 76 on the DuPont Course which was then home of the LPGA Championship. 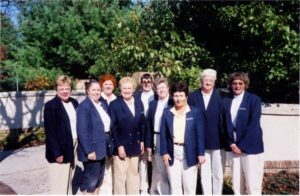 Below is a flyer showing the 2001 Tournament Schedule along with the DWGA Board Members. Looks like these ladies worked hard to put together some very nice tournaments for membership participants. 2001 brought with it, Pam Brown as the Amateur Champion. The title was not new to Brown. She also won the DWGA Amateur title in 1994 and 1995. In 2001, Brown was then a homemaker living in Landenberg, PA after retiring from her job as a business administrator at the University of Delaware in 1996. After winning this third title, Brown was quoted saying, “I just hope this gets across that experience counts alot.”. Brown received a crystal trophy and $150 for her performance but the experience was all that mattered. The DWGA kept Junior golf a priority during the 2000’s. 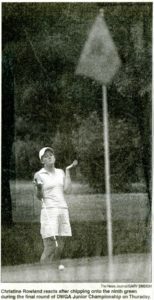 Seventeen year old, Christine Rowland won the 2001 DWGA Junior State Championship at Garrisons Lake Golf Club with an 18-shot lead over Christine Wagamon. The girls struggled on the pine-tree laden course. Intense heat mixed with a long course, combined with an agonizingly slow round resulted in disastrous scoring for the young gals. Rowland finished with an 81. Rowland credited her best friend, Kristin Gamgirt, an All-State driving champion, with helping her find her game. Roland was quoted, “We play alot and if it weren’t for Kristin, I wouldn’t practice. We met at Hartefeld and we really clicked. We are kind of joined at the hip. They call us Frick and Frack.”.Friendships like this are often mentioned throughout all the history of the DWGA. There is alot of talk about the tournaments and the champions but the DWGA has done so much more beyond growing the game of golf among women. The DWGA has brought women together to share friendships and memories. 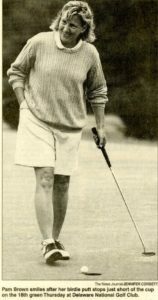 Another prominent lady who made a name for herself with golf, was Dottie Farmer. Dottie and her husband Rich both enjoyed getting out on the course and getting in a round of golf. 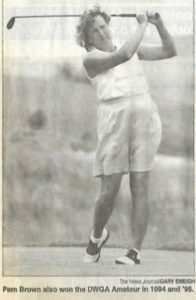 Dottie was supported and sponsored by the DWGA in the USGA State Team Championship in Wayzata, Minnesota. 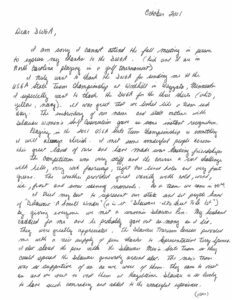 Below is a very gracious letter written by Dottie to the DWGA. 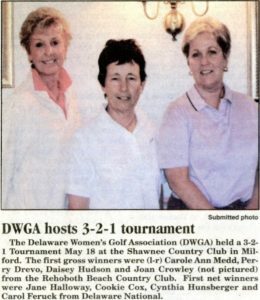 Pam Brown makes the headlines again winning her 4th Delaware Women’s Golf Association Amateur in 2002 at Delaware National Country Club. 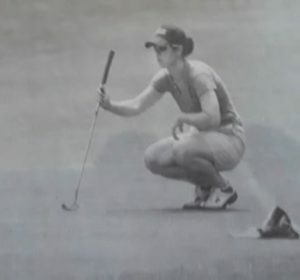 Brown was highly respected for her golfing skills, but in this Amateur Tournament, she displayed her competitive prowess where she demonstrated true grit in outlasting Mary Ann Petrillo and winning the tournament. The win came only three weeks and a day after undergoing an appendectomy. The 48-year old Brown completed her four-stroke victory with a par 72 and 54-hold 230 total. In winning the DWGA title, Brown became only the fourth player in the tournament’s 51 year history to win more than three championships. 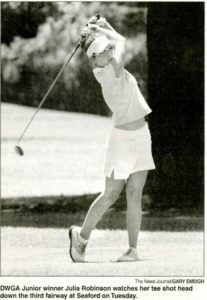 Moving on to the DWGA Junior golfers for 2002, 13-year-old, Julia Robinson claimed the title in the Delaware Women’s Golf Association Junior Championship. Robinson, from Rehoboth Beach Country Club, won by two strokes over Kaitlin Kearney of Whitford Country Club. She was quoted as saying, “Winning this tournament is a big thrill.”. Around about the year 2005 there were technological interruptions occurring occasionally on the golf course during the DWGA tournaments. Yep, you got it, the cell phones were ringing. So the DWGA instituted the “NO CELL PHONES ON THE GOLF COURSE” policy. Policies were just one of the many tasks, performed by the Executive Board Members of the DWGA. Throughout all the years of the DWGA, the organization has been very fortunate that there are some wonderful women who volunteer to serve as Board Members. Being a Board Member for DWGA never has been and never will be just sitting idlely and discussing golf. Board Members give many hours promoting golf for women. As the DWGA grew and continues to, so did the agendas for Board meetings. Just look below at some of the 2005 minutes from the Executive Board Meetings. Rating – It generally takes a full day. Need to get members certified in rating courses. Rating/Handicap Seminar – Being held at Newark CC mid April; cost $25. USGA 3 Day Tournament – Held every 2 years; DWGA will field a team. Rules Seminar – Held at Rehoboth CC, May 9th; cost $20. Treasurer’s Report – Budget reviewed. Workshops – schedule upcoming workshops. Clubs – recruit new clubs and schedules clubs for the season. Scoring – coordinate with chairman; set up scoring table at tournaments. food; website posting; distributing information to clubs. Members – solicit new members and attempt to regain old members. Wow, pretty exhausting list! Let’s always remember to be appreciative and respectful of the ladies working as Board Members of the DWGA. They do so much to bring it all together and make it happen. Thank you ladies!!! Take a read here about the 2005 Delaware Amateur. Meghan Adams can’t remember when she first started playing in DWGA events. She was just a kid, maybe 12 years old. And the score the Dover native shot for nine holes in the junior tournament wasn’t even a good one for 18 holes. “It was bad,” the 24-year-old Adams said with a laugh. So after all those years and all that history, Adams took a great deal of pride in winning the DWGA Amateur Tournament shooting an 80 in her final round at Cavaliers Country Club. DWGA Amateur Champion Meghan Adams lines up a putt en route to her victory. Here’s a few looks at some of other 2005 tournaments. 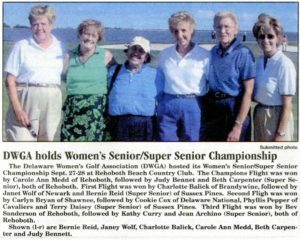 The DWGA hosted its Women’s Senior/Super Senior Championship Sept. 27-28, 2005 at Rehoboth Beach Country Club. The Champions Flight was won by Carole Ann Medd of Rehoboth, followed by Judy Bennett and Beth Carpenter (Super Senior), both of Rehoboth. First Flight was won by Charlotte Balick of Brandywine, followed by Janet Wolf of Newark and Bernie Reid (Super Senior) of Sussex Pines. Second Flight was won by Carolyn Bryan of Shawnee, followed by Cookie Cox of Delaware National, Phyllis Pepper of Cavaliers and Terry Daisey (Super Senior) of Sussex Pines. Third Flight was won by Bev Sanderson of Rehoboth, followed by Kathy Curry and Jean Archino (Super Senior), both of Rehoboth. As always, the DWGA worked to support and fund women players representing the state of Delaware in the USGA Women’s State Championship. Nothing gave back more to the DWGA than the appreciative letters women sent to the DWGA. The State Team Championships were an incredible experience. I would like to thank everyone for the funding and allowing me to represent our State. It was an honor and has also inspired me to become a better golfer. I hope in the future that I will improve my game to better represent our State of Delaware! I had a wonderful time at the 2009 USGA Women’s State Team Championship! I thoroughly enjoyed having the opportunity to play on such a beautiful and challenging course. Also, I had a fantastic time with my teammates, Karen Fergison and Sandy Dibiase. It truly was a great experience! Thank you for giving me the opportunity to compete in such a prestigious event. I had a fabulous time and learned a tremendous amount about the game! Best of luck this fall and I look forward to seeing you again soon. “Preserving and Expanding the Game of Golf in Delaware” continued to be the goal of the DWGA since its’ establishment in 1952. In 2011, the DWGA had grown to 35 member clubs, including clubs from nearby Pennsylvania and Maryland, and had over 470 individual members. The organization was governed by a ten person Board with delegates representing individual clubs. The 2012 DWGA Amateur Championship was a 3-day Tournament held at Hartefeld National Golf Club. The headlines after the tournament concluded read, “When the Delaware Women’s Golf Association’s Amateur Championship concluded Wednesday, it looked more like the Big Ten Tournament. Emily Ransone, who recently completed her junior year at Pen State, finished first. Christina Vosters, who recently completed her sophomore year at Penn State, finished second. Dana Voss, who recently completed her redshirt freshman season at Wisconsin, finished third. “It was so great. Go Lions,” Vosters said.” Ransone had plenty to be happy about after winning the 54-hole tournament by a whopping 17 strokes. She added a 73 to her first two rounds of 69 and 68 to finish at 6-under-par 210. “They had some tough pins and they lengthened the course a little bit, so it was playing a little differently, Ransone said. “It was fun out there, though.” Ransone was then from Columbus, Ohio, but was spending four months as an intern at Wilmington Country Club. Members from the Wilmington Country Club were out at the tournament and cheered Ransone on to victory. The DWGA Senior Championship went to an exciting finish in 2012. The tournament, a 2-day tournament, was held September 9th and 10th at the Rookery. Arlene Zamora, from Chesapeake Bay Golf Club, won in a playoff and was awarded the Commemorative Trophy as the Overall Champion along with a gift certificate for the Rookery. As our membership continues to grow, the DWGA grows as well. We thank all of our members for being a part of our history and welcome new members to become a part of it. And don’t every stop the Par-Tee!